Well, issue #102 of Christian History magazine has now rolled off the presses, and can also be read here (once you’ve followed the link, click twice to render the text a little larger, though it’s still unfortunately small). AMERICAN CHRISTIANITY IS, at the very least, odd. How odd is not always apparent to those of us who live inside it, for whom the story of denomina­tional competition, freedom from an established church linked with governmental power, and a marketplace of religious choices is the norm. G. K. Chesterton once said that the United States is “the only nation in the world that is founded on a creed.” In many ways, that creed is a religious one. The United States itself is seen as something to have reli­gious faith in. Over the years, many Americans have defined themselves as people who came here seeking religious freedom and who are still, despite everything, a religious people. While this story is true, it is true in more com­plicated ways than we imagine. Christian History has devoted many issues to exploring those complicated and diverse stories—from Spanish missions in California, to conversions on the western frontier, to businessmen kneeling to pray in unexpected revivals, to the faith of American presidents. (Some links to those specific sto­ries can be found in the “Recommended resources” on pages 21 and 41). 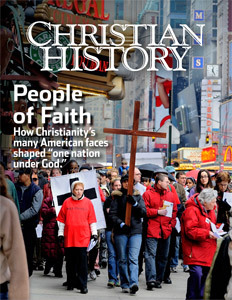 In this issue of Christian History, we step back and take a look at two main themes running through all these narratives. American Christianity is, and has been from its inception, diverse. It has thrived in unexpected ways and places. It has also been an active faith which has felt itself entitled to change society and has tried very hard to roll up its sleeves and do just that. But precisely because of our diversity, we have had different visions of what it means to thrive and how best to reform society. Those visions have often clashed, in ways described specifically by this issue’s writers. And the religious and political situation in 2012 presents no evidence that we have come to any consensus about these matters. While this issue alone will not bring us to con­sensus, it is the editors’ hope that it will help us to understand how we got where we are today and to think about productive ways to move forward. What did the founding fathers really think about the separation of church and state, and how has that separation been seen differently throughout the years? What did early settlers think about religious freedom—what were they being freed from, and what were they being freed for? How did the vision of America as a “Christian nation” translate in prac­tice into its being a Protestant nation, and how did Protestants react when they realized that immigra­tion and religious diversity threatened that vision? What social issues have Christians fought for over the years, and why do we so often find ourselves fighting on opposite sides? What is God’s vision for the future of Christianity in America? Will it con­tinue to grow, thrive, and try to change the world, or is the future not so clear? This issue is published as a companion to the Institute for the Study of American Evangelicals’ People of Faith DVD set (available from Vision Video), which also considers these issues and takes the viewer deeper into the ways in which religious history has been central to American history. We recommend the DVDs and the ISAE website at http://isae.wheaton.edu as additional resources for continued exploration of these questions. Meanwhile, listen in on the conversation here, and see what it has to tell us about how Christianity has changed America—and how America has changed Christianity.